The brakes slow the car by creating friction when you apply the brake pedal. Funny thing about cars. They generally have one purpose: to get you from here to there. But almost everyone will tell you that the most important system in those cars is the brake system… a system designed to stop the car. And not much wonder: When you’re behind the wheel of a projectile, hurtling through space at 40 MPH, the one thing you want to be sure of is that you have the ability to bring it to a stop… quickly and efficiently. That, in a nutshell, is what your car’s brake system is designed to do. Of course, there’s a lot more to it than that (there always is, isn’t there?) Actually the brakes are designed to slow the wheels, by applying friction to them. As the wheels slow, the car should slow down with it. But for that to work effectively, all four wheels have to do their share of applying friction. If one wheel takes on too much load, it can lock up and skid. If one doesn’t do enough, it puts more load on the rest, and the car takes longer to come to a stop. So keeping your brakes working properly is critical for your safety… and the safety of your passengers. If the brakes aren’t working right, you and everyone around you can be at risk. That’s where your friends at Cottman can help. Their technicians are experts on today’s complex braking systems. They can examine your brake system, analyze how it’s operating, and perform any brake services necessary to bring them up to proper working condition. They know which brake services your car needs, and maybe just as important, which services aren’t necessary. 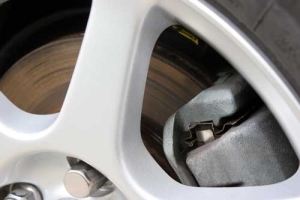 So, when you bring your car to Cottman to have your car’s brakes serviced, you can be sure you’ll receive professional service at a fair price. If you suspect a problem with your car’s brake system, or you just want to have them checked for a little piece of mind, find your local Cottman center and set up an appointment today.